عابدی کوپایی, جهانگیر, سلطانیان, سمانه, قیصری, مهدی. (1394). تأثیر الیاف پلی پروپیلن بر ویژگی‌های مکانیکی ماسه بادی. نشریه آبیاری و زهکشی ایران, 9(1), 22-31. جهانگیر عابدی کوپایی; سمانه سلطانیان; مهدی قیصری. "تأثیر الیاف پلی پروپیلن بر ویژگی‌های مکانیکی ماسه بادی". نشریه آبیاری و زهکشی ایران, 9, 1, 1394, 22-31. عابدی کوپایی, جهانگیر, سلطانیان, سمانه, قیصری, مهدی. (1394). 'تأثیر الیاف پلی پروپیلن بر ویژگی‌های مکانیکی ماسه بادی', نشریه آبیاری و زهکشی ایران, 9(1), pp. 22-31. عابدی کوپایی, جهانگیر, سلطانیان, سمانه, قیصری, مهدی. تأثیر الیاف پلی پروپیلن بر ویژگی‌های مکانیکی ماسه بادی. نشریه آبیاری و زهکشی ایران, 1394; 9(1): 22-31. یکی از روش­های مقابله با خاک­های مشکل آفرین از جمله خاک­های ماسه بادی تسلیح خاک است. تسلیح خاک یکی از شاخه­های ژئوتکنیک است که مواد و مصالح مناسب را در تقویت خاک به کار گرفته و مشخصات مهندسی و خواص مکانیکی از جمله مقاومت، سختی یا ضریب کشسانی، شکل­پذیری و ظرفیت باربری آن را بهبود می­بخشد. عناصری که در تسلیح به کار می روند از جنس فلزات، مواد پلیمری و حتی گیاهان هستند. 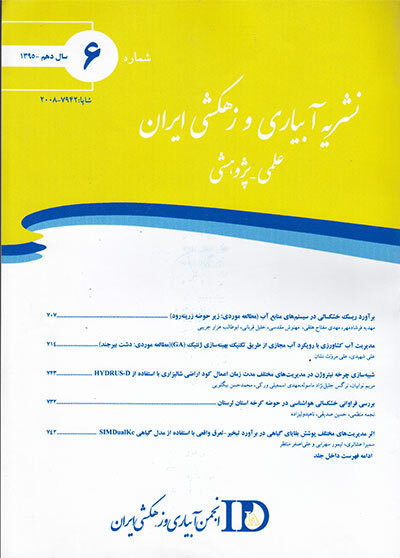 دراین مطالعه به تأثیر الیاف پلی پروپیلن (در دو طول 6 و 12 میلی­متر) با درصدهای متفاوت (05/0%، 1/0%، 15/0% و 25/0%) بر پارامتر های برشی، مشخصات تراکمی و ظرفیت باربری خاک پرداخته شد. نتایج استخراج شده در قالب طرح کاملاً تصادفی مورد تجزیه وتحلیل آماری قرار گرفت و مقایسه میانگین­های آن­ها در سطح آماری1% انجام پذیرفت. نتایج نشان داد که هیچ یک از طول­های الیاف پلی پروپیلن تغییر معنی­داری بر روی رطوبت بهینه، بیش­ترین وزن واحد حجم خاک و چسبندگی خاک ایجاد نکردند. درحالی که هر دو طول الیاف نامبرده باعث افزایش معنی­دار زاویه اصطکاک داخلی، ظرفیت باربری خاک شدند. Soil reinforcement is one of the techniques of dealing with problematic soils like sandy soils. Use of appropriate materials in soil reinforcement, improves the engineering properties and mechanical principles of soil such as strength, stiffness or elastic coefficient, ductility and bearing capacity. Materials for reinforcement include metal, polymer materials and even plants. The present study investigates the effect of poly propylene fibers (6 and 12 mm in length) with different percentages (% 0.05, % 0.1, % 0.15 and % 0.25) on shear parameters, density specifications and soil bearing capacity. The obtained results analyzed statistically in a completely randomized design, and their mean comparison organized in statistical level of %1 (P<0.01). Results show that none of the poly propylene fibers have significant effect on optimum moisture and maximum weight per unit volume of soil adherence. While both lengths of mentioned fiber have a significant increase in angle of internal friction, bearing capacity of soil . ابطحی،م. 1388. استفاده از مواد شیمیایی نوین جهت تثبیت خاک، هشتمین کنگره بین المللی مهندسی عمران، 21 الی 23 اردیبهشت، دانشگاه شیراز. رحیمی،ح. 1379 . مسائل احداث کانال­های آبیاری در خاک­های نامتعارف (مشکل­آفرین). مقاله کارگاه فنی- آموزشی ساخت کانال­های آبیاری محدودیت­ها و راه­حل­ها، 128 – 163. غیاثیان،ح.، پورابراهیم،غ. 1383. بهبود مشخصات مقاومتی ماسه با استفاده از الیاف پلیمری، مجله استقلال، سال 23، شماره2. Andersland,O.B and Khattak,A.S. 1997. Shear Strength of Kaolinite/Fiber Soil Mixtures, Proceedings in the conference on Soil Reinforcement . Paris, France. Arenzic,R.M and Chowdhury,R.N. 1988. Laboratory Investigation of Earth Walls Simultaneously Reinforced by Strips and Random Reinforcement, Geotechnical Testing Journal. 11.4: 241-247. BensonC.H and Khire,M.V. 1994. Reinforcing Sandwith Strips of Reclaimed High-Density Polyethylene, Geotechnical and Geoenvironmental Engineering 120: 828-855. Dean,R and Freitag,F. 1986. Soil Randomly Reinforced with Fibers, Journal of Geotechnical and Geoenvironmental Engineering. 112.4: 823-827. Gray,D.H and Ohashi,H. 1983. Mechanics of Fiber Reinforcement in Sand, Journal of Geotechnical and Geo environmental Engineering.109.3: 335-353. Hoare,D. 1982. Synthetic Fabrics Soil Filter, Journal of Geotechnical and Geo environmental Engineering. 108.10: 1230-1246. Maher,M.H and Gray,D.H. 1990. Static response of sands reinforced with randomly Distributed fiber, Geotechnical Engineering 116: 1661-1677. Nataraj,M.S and McManis,K.L. 1997. Strength and deformation properties of soils reinforced with fibrillated fibers, Geo synthetics. 4:65-79. Ranjan,G., Vasan,R.M and Charan,H.D. 1996. Probabilistic Analysis of Randomly Distributed Fiber Reinforced Soil, Journal of Geotechnical and Geo environmental Engineering. 122.6: 419 – 426. Sheng,T.C. 2010. Interfacial shear strength of fiber reinforced soil, International journal of Geotextiles and Geo membranes. 28: 54 -260. United states department of agircuture. 1984. Standards Soil Mechanics Testing Soil Mechanics.Note No.8. Wang,Y., Frost,J.D and Murray,J. 2000. Utilization of Recycled Fiber for Soil Stabilization, Proceedings of the Fiber Society Meeting, May 17-19, Guimaraes, Portugal. 59-62. Yetimoglu,T., Inanir M and Inanir, O.E. 2005. A study on bearing capacity of randomly Distributed fiber-reinforced sand fills overlying soft clay, Geotextiles and Geo membranes 23:174-183.